Not true, according to the Canadian Ice Service. While freeze-up is usually well under way by early December in Hudson Bay, it is by no means normal for it to be “frozen over” by early December (which I take to mean totally frozen over). Historical ice charts from the Canadian Ice Service show this to be so. In the three graphs from the CIS below, I’ve included the historical data for Dec. 11 (“early Dec.”), Dec. 25 (“late Dec”) and Jan. 08 (representing conditions earlier this week). In all of these maps, the bright green line marks the average, bright green bars are “first year ice,” the purple is “young ice” and the pink is “new ice”. Figure 1. 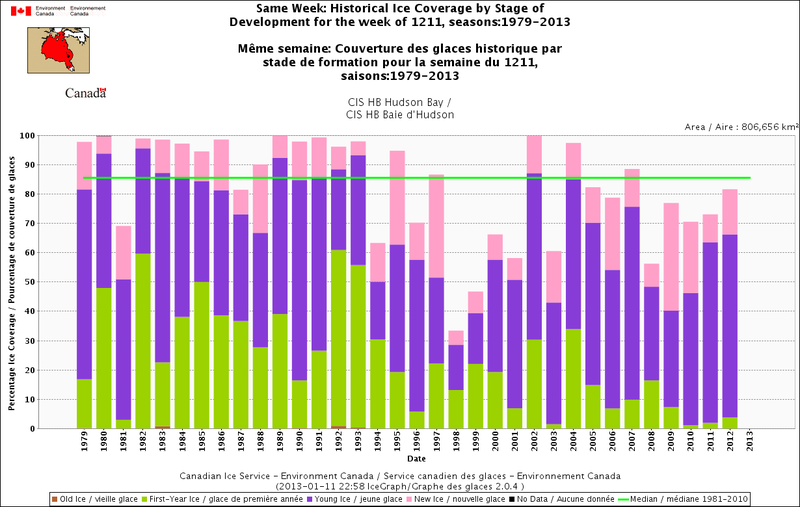 Historical ice coverage at December 11, from 1979 (start of satellite record) to 2012, by stage of development. From the Canadian Ice Service. Figure 2. 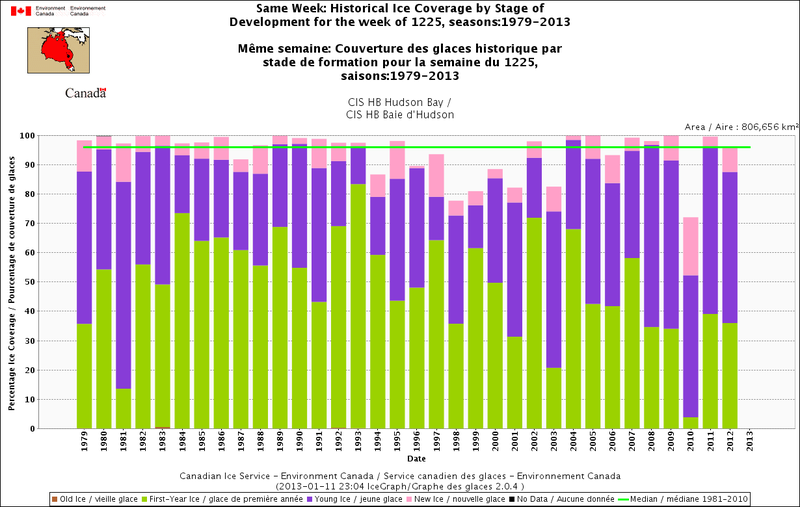 Historical ice coverage at December 25, from 1979 (start of satellite record) to 2012, by stage of development. From the Canadian Ice Service. Figure 3. 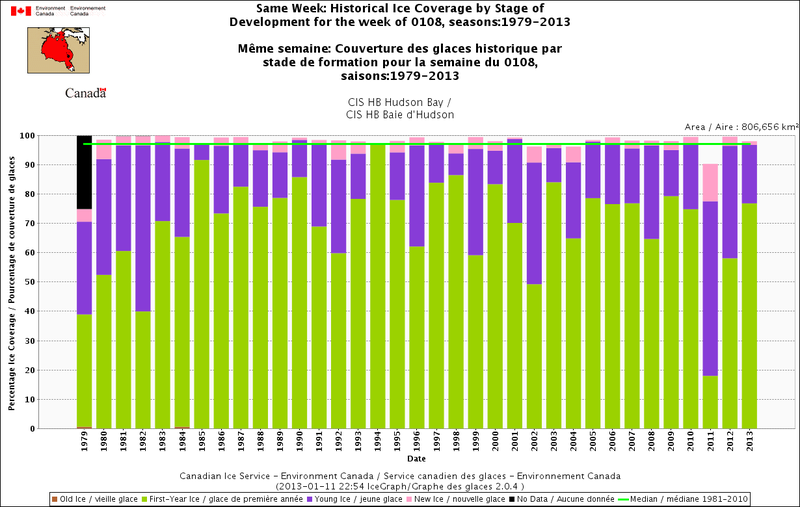 Historical ice coverage at January 8, from 1979 (start of satellite record) to 2013, by stage of development. From the Canadian Ice Service. Regarding Morissette’s second claim, that killer whales becoming trapped in eastern Hudson Bay in early January is a direct result of global warming (“climate change”), I say nonsense. The problem – for killer whales – is that sea ice tends to form in northern and western Hudson Bay first and thicken there faster (see maps below, from November 30, 2012 (Fig. 4) and December 21, 2012 (Fig. 5), potentially closing off the narrow “neck” of the bay and their escape route to open water. This is the normal sequence and timing of freeze-up (Gagnon and Gough 2005). The sea ice maps show that the whales were probably in trouble as early as the first week in December – we just didn’t know it. Figure 4. Sea ice extent in Hudson Bay at November 30, 2012. 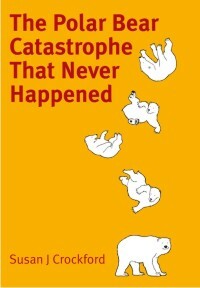 From CIS. Figure 5. Sea ice extent in Hudson Bay at December 21, 2012. From CIS. In summary, the average ice coverage for December 11 in Hudson Bay has been about 85% (which is not “frozen over”) and 2012 was only slightly below that average. By December 25, the average ice coverage has historically been about 97% and 2012 was spot on average for that date. By January 8 (the date this year that the killer whales were noticed to be trapped in the eastern part of the Bay), the average coverage has historically been less than 100% (about 98% or so) and 2013 is actually above average for this date! The sea ice in Hudson Bay starts to freeze in the northern and western regions first while the eastern portions are generally the last to freeze. 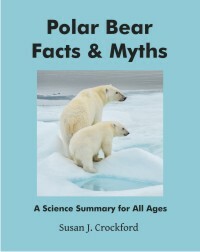 Lyne Morissette is right to say that killer whales should not be in Hudson Bay at this time of year but she is wrong to say their plight is a consequence of global warming (and so is Peter Ewins of the World Wildlife Fund, quoted here). The killer whales got trapped because the sea ice formed in northern and western part of the Bay before it froze in the east – as it has done for more than 30 years – and they simply stayed too long. The sea ice charts for Hudson Bay tell us that the ice extent for early January 2013 is above normal, not below, and the sequence of ice formation this winter has been quite normal. 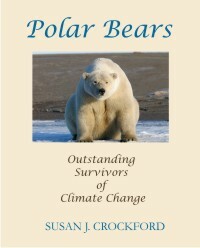 This entry was posted in Sea ice habitat and tagged Canadian Ice Service, Hudson Bay, sea ice extent. Bookmark the permalink.